Nuremberg (German: Nürnberg) is a city in the German land of Bavaria, in Middle Franconia. It is on the river Pegnitz and the Rhine-Main-Danube Canal and is Franconia's largest city. 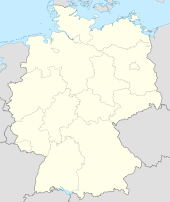 It is about 170 kilometres (110 mi) north of Munich, at 49.27° N 11.5° E. As of December 2012, there were 495,121 people. From 1050 to 1571, the city became very important because it was on key trade routes. Many of the parliaments of the Holy Roman Empire (called the Reichstage) met at Nuremberg Castle. The Diets of Nuremberg were an important part of the administrative structure of the empire. In 1219 Nuremberg became an Imperial Free City under Emperor Frederick II. This meant it was ruled by the Emperor, not one of the local lords or princes. 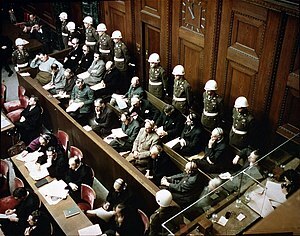 It also meant that Nuremberg had a seat in the Imperial Parliament. In 1298 there was a big '. Nearly 700 Jews were killed. The Jews lived near the river, and by getting rid of the Jews the northern and southern parts of the city could be linked together. This area is now the place of the City Market, Frauenkirche and Rathaus (City Hall). ↑ "Nuremberg". Catholic Encyclopedia. http://www.newadvent.org/cathen/11168a.htm. This page was last changed on 20 January 2014, at 23:26.